If you’re one of those people who get frustrated trying to find a spot to park in Glenwood South, you’ll want to read this. Does this sound like you? I prefer on-street parking, but drive around in circles and rarely find an open spot. I know of a few parking decks, but I don’t like to park there and avoid them. I wish there were more surface parking lots. If so, you probably didn’t know that in addition to the three multi-story parking decks, there are 10 parking lots in Glenwood South, yet most of these parking lots are rarely used. Why? You can easily drive right by them, because they’re behind buildings or hidden behind shrubbery. Another reason these lots are under-utilized is that they are associated with private businesses, so people assume they’re not available. Like most others, you avoid the risk being towed. You may be surprised to know that Glenwood South has seven publicly available after-hours lots with a combined 138 spaces. This is thanks to companies like Park Select, who have developed a business model focusing on small private lot owners, encouraging them to make their lots available to the public during after-hours, after their business is closed. There’s now an online app that explains it all. It’s pretty simple really, a mobile (smart-phone) friendly web based application that shows all the lots on a map, and provides information on rates, methods of payment and hours of operation. It even has a link to launch your phone’s map application so you can get turn-by-turn directions. 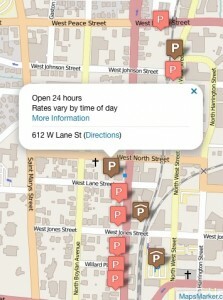 Bookmark this page www.gsnc.raleighdla.com/parking and use it every time you’re heading over to Glenwood South. Each marker on the map identifies the type and location of a parking deck or lot. Select a marker and click “more information” for details on rates, methods of payment and hours of operation. Click the Park & Ride option [add link] to learn how and where to park for free in the State Parking Complex, then jump on the R-Line for a short ride to Glenwood South. 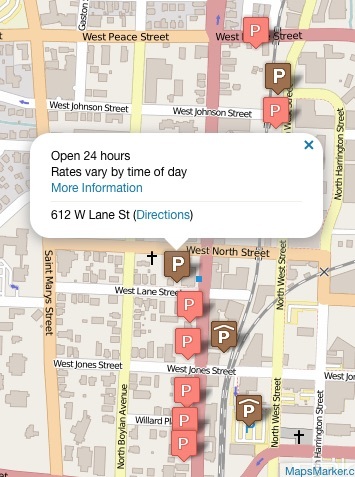 Members of the Glenwood South Neighborhood Collaborative and DTRaleigh.com worked together in the development of this online parking application, and based on feedback from neighborhood merchants and the public we hope to expand the area to include other downtown districts. Post your comments on this blog post, or contact the Glenwood South Neighborhood Collaborative at GlenwoodSouth@downtownraleigh.org.